In the late 70’s, Top Trumps emerged as a favourite pastime amongst children. Now seen as a classic card game, its popularity continues even today. Children, predominantly boys, would collect as many packs of the cards as their pocket money would allow, swapping any duplicates, or ‘spares’, with friends. The game would revolve around opponents comparing their cards statistics. 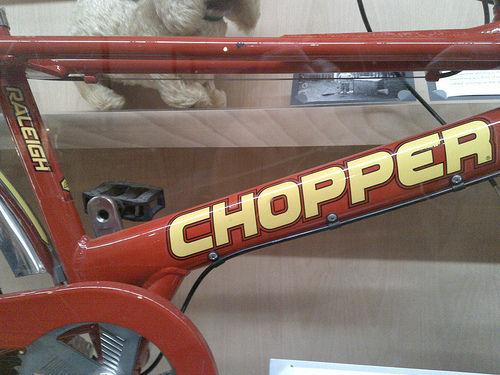 The classic Chopper bike was equally popular amongst the older children of the 70’s, channelling the likes of Dennis Hopper in iconic film Easy Rider. They weren’t perhaps the most practical of bikes , but they sure as hell looked cool! Owning a pellet, or ‘BB’ [ball bearing] gun, gave boys of the time a chance to live out their inner rebel. If the idea of a somewhat dangerous object in the hands of a youngster was just too much for parents to bear, there was always the slightly safer alternative, the cap gun. Instead of fireable pellets, cap guns would release a bang followed by a small wisp of smoke. All of the satisfying side effects of a gun with none of the risk. It was for this love of risk that stunt rider Evel Knievel captured the heart and attention of so many in the 1970’s. Knievel themed stunt bikes and accessories were created for the younger boys to role play with, complete with the all-important ramp for the stuntman and his motor bike to perform the infamous leaps of faith and death defying acts. Slightly calmer pursuits of the 70’s were the classic home craft and creation kits, which saw a surge in popularity around the time. Toys that imitated the adult work place had grown increasingly popular over the years. While girls of the era had candle making, tie die kits and beaded jewellery making, the boys were targeted by ad campaigns featuring the arguably more impressive chemistry sets and microscope kits, complete with plant and animal cell slides to examine. Boys arguably held the monopoly when it came to the attention of 70’s toy companies’; Toy D.I.Y kits; Intricate die-cast toys based on the favourite films/TV programmes of the era like Star Wars and classic cop show, Starsky and Hutch; The chance to role play with cap guns, pellet guns and Chopper bikes. The 70’s were a truly productive time when it came to boys' toys. Thanks to Kieran Harris for this post. Kieran writes on behalf of Boutique To You – an online gift store, catering for all occasions.